Aggressive & Results Proven Personal Injury Lawyers Are Available 24/7. Call Us NOW for All Of Your Personal Injury Needs. We Are Here To Help! Voted Best Boca Raton Personal Accident and Injury Law FirmOur Palm Beach County personal injury lawyers are committed to the principle that the practice of law should be a customer service oriented endeavor. When you are struggling with decreased household income and spiraling medical bills, we know your physical challenges can be magnified by the stress of a complex legal process. At the Shiner Law Group, we are committed to demystifying the legal process and keeping our clients informed through the duration of their case from our initial investigation to providing funds for a settlement or verdict. We understand that the lack of communication is the most prominent complaint about attorneys, so we have a law firm policy of trying to respond to all calls and emails the same or next business day. We also provide our clients with updates when significant developments occur and/or at reasonable intervals during the process.How the Experienced Accident Injury Lawyers at the Shiner Law Group Can HelpThe lawyers at the Shiner Law Group have experience representing individuals injured by the intentional and negligent conduct of other individuals, corporations, and government entities. While some injury victims attempt to handle their own legal matters when pursuing a claim for damages, this strategy is dangerous because insurance companies have many advantages. The insurance carrier has insurance defense attorneys, claims adjusters, accident reconstruction experts, extensive litigation experience, and a financial war chest that is nearly unlimited. Our Palm Beach County personal injury lawyers can provide a significant number of benefits to balance the scales of justice for injured persons taking on large commercial and public entities, such as:Knowledge of Traps for the Unwary: When an injury victim navigates the legal and insurance claims process, there are many traps for the unwary. If a plaintiff fails to respond in a timely fashion to a discovery request, the result can be sanctions that result in liability for the other side’s attorney fees and/or court rulings damaging the claim. When you fail to comply with critical deadlines, such as those established by the Florida Tort Claims Act (FTCA) or the statute of limitations, your claim can be severely damaged. Failure to give notice under the FTCA when suing a public entity will result in the plaintiff being barred from suing the government. If an uninsured driver hits you on a road that is unsafely designed, your ability to obtain damages from the government entity responsible for the roadway might constitute the difference between receiving fair compensation and no recovery. When a plaintiff fails to file their lawsuit before the expiration of the statute of limitations, noncompliance with this deadline can bar your lawsuit without consideration of the merits of your claim. Our attorneys at Shiner Law Group guide our clients through the litigation process avoiding these types of procedural pitfalls.Network of Highly Regarded Experts: Many personal injury cases become a battle between experts with specialized knowledge about accident reconstruction, medical facts, manufacturing processes, trucking industry safety, and a multitude of other disciplines. Because our accident injury lawyers have handled hundreds of personal injury cases, we have an established network of industry-specific experts who can provide guidance in untangling complex evidence, testify about the required standard of care, identify negligent conduct that deviates from industry and safety standards, and provide other support for our clients’ cases. We routinely work with many types of experts, including but not limited to the following:•	Accident Deconstructionist•	Trucking Industry Experts•	Forensic Accountants/Economists•	Vocational Counselors•	Manufacturing Experts•	Engineers•	Construction Experts•	Law Enforcement OfficersThese are only a few examples of individuals with specialized knowledge that we might utilize when constructing a personal injury or wrongful death claimfor our clients. We recognize that an expert with impeccable credentials and the ability to explain complex concepts to laypersons can have a significant impact on the outcome of a lawsuit.Assuming the Financial Risk of Litigation: Although the cost of funding a lawsuit can vary widely based on the facts and circumstances, our law firm generally advances the cost of litigation. Most people do not have tens of thousands or hundreds of thousands of dollars to dedicate to bankrolling a lawsuit. Our law firm advances these costs, which will ultimately be covered by the judgment or settlement we obtain from our client. Our law firm represents injury victims and families on a contingency fee basis, so you typically only owe attorney fees when we recover compensation through a verdict or settlement. Because the attorney fees you pay will be a percentage of your damages, our law firm typically assumes the financial risk. We also have a strong motivation to obtain the fullest recovery for our clients.Effective Discovery & Investigation of Facts: Whether we are representing individuals injured by a fatigued trucker, distracted driver, or a defective product, our law firm engages in a thorough investigation of the facts and circumstances. This initial investigation, which might include obtaining law enforcement accident reports, visiting the site of an accident, and analyzing your medical records, will inform our use of the discovery process. Effective discovery will significantly impact the outcome of your personal injury claim. We might use depositions, document requests, interrogatories, requests for admission, document subpoenas, and other discovery tools, so we can narrow the issues, reveal potential defenses, develop theories of liability, and otherwise build a compelling case for our clients.Protecting Plaintiffs from Ill-Advised Disclosures: Without an experienced personal injury lawyer, plaintiffs might make damaging statements to insurance adjusters, such as a car accident victim admitting that he or she was not buckled up when the crash occurred. Even when plaintiffs do not directly make damaging admissions to a representative of the insurance company, unrepresented clients who share accident information on their social media websites can undermine their claim because insurance investigators now routinely search the social media pages of injury victims. While a person who has injuries will have good days and bad days, pictures of you engaged in certain physical activity could be problematic when you are pursuing a claim for a severe back injury that resulted in permanent disability. While some people think posting information in password-protected areas of social media websites constitutes a safe practice, a growing number of lawsuits have been impacted by a judge ordering the plaintiff to provide login information to secure areas of social media pages. Judges have also held sanctioned parties that have attempted to delete damaging information after being ordered to provide login credentials.Attorneys Focused on Personal Injury Law: Although you might have had an estate planning lawyer draft a simple will, you can gain a substantial advantage by working with an experienced personal injury and wrongful death lawyer. Areas of legal specialization are too complex for a single attorney to effectively handle many different areas of law. At Shiner Law Group, we are litigators with a practice narrowly focused on serious injury claims. I just finished a long day of legal issues and Shiner was at my side the entire time. He prepped me well and I felt prepared. I highly recommend you hire Shiner Law Group if you have any civil litigation issues. David Shiner is a hard working individual that is prompt and fair and will whatever it takes for his clients. 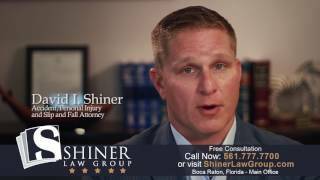 The Shiner Law Group solved my issue and helped me when I needed it most. I would recommend them to anyone!! Thank you! Shiner Law Group was aggressive with my case and I would highly recommend their company. The case was a success! Shiner Law Group did a phenomenal job with my case. Not only was the communication and hard work top notch, the case was won! Select case type... Animal Law Automobile Accidents Automotive Products Liability Banking Law Bankruptcy Boating Accidents Business Law Business Litigation Commercial Law Commercial Litigation Contracts Dog Bites Food Products Liability Foreclosures General Practice Health Care Labor and Employment Legal Malpractice Litigation Medical Malpractice Motorcycle Accidents Negligence Nursing Home Litigation Personal Injury Products Liability Real Estate Slip and Fall Transportation Trucking Accidents Wrongful Death Other Case type is required.